“The times they are a-changing’…” an old Bob Dylan song declares. They most certainly are. I doubt anyone who was in dogs back in 1964 when the song was a hit dreamed we would be able to determine a dog’s genotype directly from its DNA. The science of genetics has made tremendous advances in the past couple of decades, including the recently completed sequencing of the canine genome. These advances have lead to better treatment and diagnosis for our dogs as well as new screening tests. As time goes by there will be more and more DNA screening tests available. Every breeder must understand how those tests work and how to apply them as we enter this brave new world of genetic testing. The first DNA screening tests for humans were developed in the late 1970s, but were unsuitable for widespread clinical use because they were difficult and expensive to perform. By the early 1990s, techniques had improved and clinical DNA health tests for humans became more common and affordable. The first canine tests began to appear in the mid-1990s, with a test for a form of hemolytic anemia found in Basenjis being among the first. While some early tests were able to positively determine the presence of a gene, many were “marker tests.” Genes are not easy to locate. Early on it was all but impossible until scientists had completed full genome scans on several different species. This allowed them to search for homologous (equivalent) genes. Even so, sometimes the best anyone can do is figure out approximately where on a chromosome a particular gene is located. When that is established, researchers select microsatellite markers close to the gene’s suspected position for use in a clinical test. Microsatellites are sequences of repetitive non-coding DNA. They have been studied for a long time and the positions of many were established before the canine genome work began. So far as anybody knows, they have no function. Microsatellites are highly polymorphic, having many different alleles, or forms. Since they are non-coding, they are not directly subject to selection pressure from breeders’ choices or nature. This makes them useful for identifying relationships among individuals within a population. They have provided valuable data on the development of the domestic dog. Microsatellites are also used to develop DNA “profiles,” a listing of microsatellite alleles located on several different chromosomes, used for parentage verification testing and positive identification of individuals. They are also used in DNA marker tests for health screening. The newly rearranged chromosomes then separate and go individually into germ cells. 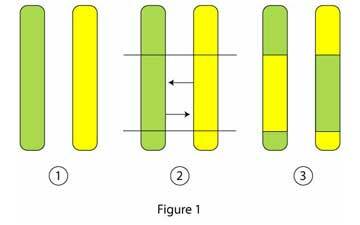 Microsatellite markers used for screening tests are on the same chromosome as the disease gene. The closer they are to that gene, the more likely they will be inherited with it and the more accurate the test will be. 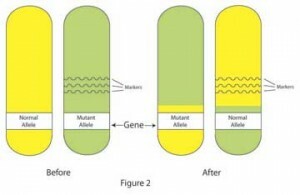 The markers selected will have different alleles linked to the mutant and normal versions of the disease gene. Multiple markers are preferable to reduce the possibility that they will become separated from the gene during recombination. Determining which marker alleles a particular dog has will indicate whether it might have one, two or no copies of the mutant gene. Marker tests are often breed-specific. Since microsatellites have so many alleles, the markers linked to the gene in one breed may differ from those in another even though the breeds have same inherited disease. In fact, markers may vary from family to family within a breed. For a test to be most useful, it needs to look for all of the most likely variations. Figure 2. Microsatellite markers can become separated from the target gene during recombination. If this happens, marker tests will give false results. Use of multiple markers and the close proximity of those markers to the target gene reduce the risk, but even so it happens occasionally. If you want to use a marker test, you should first verify the rate of false results for the test. 100% accuracy isn’t possible, but the closer it is to that number, the more accurate the test. Thanks to improvements in technology, genes are being located with greater and greater frequency, spurring development of a growing number of direct gene DNA tests. A direct gene test greatly reduces the possibility of false results. Almost all false results are due to human error, through mislabeling or contamination of samples. A direct gene test will reliably show whether the dog has one, two or no copies of the mutation. One of the greatest advantages to using DNA tests over traditional screening methods, like eye exams, x-rays and blood tests, is that you can find out which dogs may be affected before symptoms develop. You will also know whether or not a breeding dog is a carrier before it produces a diseased puppy. This is never the case with standard eye and orthopedic exams and rarely true with traditional blood tests. DNA tests can be done early, generally before the dog is 6 months old. Early testing enables you to identify dogs that may have a problem before breeding and before a major investment has been made in training or campaigning. If samples are submitted with cheek swabs, you can gather samples before puppies leave for their new homes. The test cost can be built into your puppy price. Tests requiring blood samples need to be done later, because of the volume of blood required but can still be done while the dog is young. You can collect and submit samples for some DNA tests yourself. 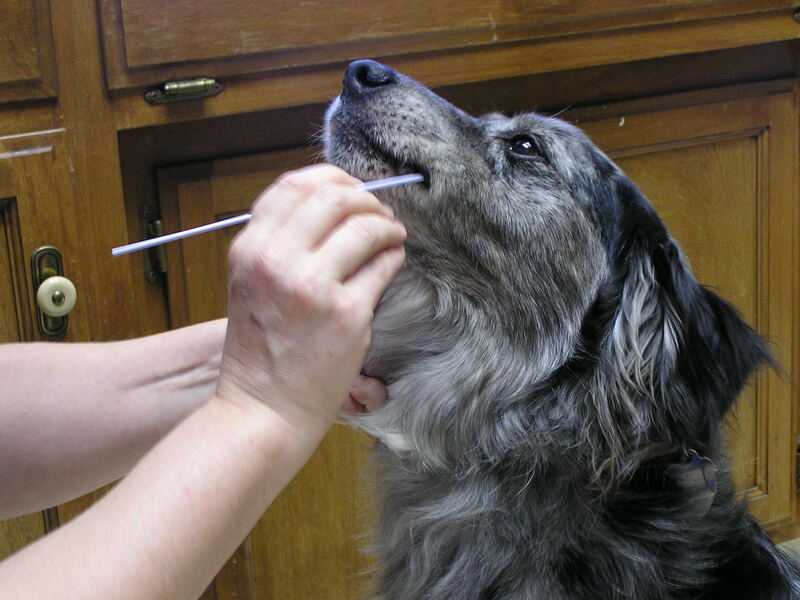 Such tests usually accept samples on cheek swabs. If you gather samples yourself, it is extremely important that the directions provided be followed to the letter. The easiest way to get a false result, or no result at all, is to mix up labels or contaminate the samples with DNA from another dog, animal or person. If this happens, you will have to re-run the test at your own expense. Technological advances are already allowing researchers to examine multiple genes at the same time. It may soon be possible to identify the sets of genes responsible for polygenic disorders like hip dysplasia. Eventually, this technology will become practical for clinical use. Breed-specific test panels will be developed, targeting each breed’s set of common genetic ailments. This type of intensive screening will require a thorough knowledge of the genetics of each disease, gene frequencies within each breed, and other technical knowledge. Clinical veterinarians or, more likely, vets specializing in genetic counseling will be needed to interpret the results and offer you advice on how best to proceed. At present there are a variety of DNA health-screening tests for Australian Shepherds. Two, MDR1 (multi-drug resistance 1) and a hereditary cataract screening test for the gene HSF4, should be considered mandatory in Australian Shepherds. MDR1 tests for a mutation present in approximately half the breed that can cause serious-to-fatal drug reactions; every Aussie should have it. Breeding Aussies should have the cataract test; the HSF4 mutation, present in approximately a quarter of Aussies, is a dominant risk factor gene making any dog that has it more likely to develop cataracts. If both parents of a dog have previously tested clear, there is no need to test it. There are a number of other health tests, most notably for Collie Eye Anomaly and Progressive Rod Cone Degeneration (a form of progressive retinal atrophy), which should be given to breeding dogs if a relative is affected relative or a carrier of the mutation. There are also several color gene tests available. One is for a gene traditionally referred to as “E” by dog breeders. The gene, MC1r (melanocortin receptor 1), can produce yellow color which is a disqualifying fault in Aussies. This is one of the most frequently encountered unacceptable coat colors present in Aussies. Having tests available is one thing, but knowing how best to make use of them is another. They aren’t cheap—per dog prices range from a low of around $30 to upwards of $400. You need to determine which are a “must,” what circumstances indicate you should do others, and which may not be necessary at all. Because of the cost can be significant, if more than one laboratory offers the test, as is the case with TYRP1, shop around. Some tests, like MDR1 and CEA, are offered only by a single lab. Even so, it doesn’t hurt to check their websites and literature to see whether they offer group or litter discounts. The good news on testing expense is that as time goes by and the technology becomes more commonplace, it will go down. Even though cost is important, you shouldn’t base your decision on whether to use a test on what you have to pay for it. The health of the breed, as well as your individual dogs, may depend on effective use of these tests if a disease is common or has serious health implications. The MDR1 test provides an excellent example, because the mutation is so common in Aussies and the consequences can be deadly if a dog receives the wrong drugs. Since dogs with even a single copy may react to some drugs, all Aussies should be tested unless their parents were both had “normal/normal” test results. When you test your dog, you will receive a report stating whether your dog has one, two, or no copies of the mutation. Exact terminology can vary from lab to lab. What this means for the dog will vary depending on the specific disease and how it is inherited. If a disease is less frequent in the breed, like Collie Eye Anomaly, the only dogs that need to be screened are those closely related to an affected dog. First-step relatives (parents, offspring and full or half siblings) should be tested to determine their status. Then test any first-step kin of dogs found to have the mutation who aren’t already tested until all connections are identified. This applies to all breeding animals and, in the case of a gene like MDR1 that can have serious consequences for the dog itself, every relative. If the disease being tested for is recessive, the parents and offspring are obligate carriers and need not be tested unless there is a chance they may have inherited a second copy of the mutation. Dogs offered at public stud should have every DNA test available for their breed. It only takes one popular sire to turn a relatively infrequent disease like CEA in Aussies into a common one. A secondary use of DNA tests is to verify the accuracy of a diagnosis made by other means. In the case of CEA, both normal and affected misdiagnoses are possible under some circumstances. Healthy merle dogs are occasionally misdiagnosed as being CEA-affected. This was the case with a dog presented to me for pedigree analysis. It had been diagnosed with CEA after having a normal puppy exam, which is an unlikely occurrence. I found no connection to identified cases of CEA in the pedigree and suggested the DNA test. It came back normal/normal. The most common CEA defect may be missed if it is minor or if the dog is not examined by the time it is 6-7 weeks old. Early exams are necessary because the pigment that develops within the eye after that time may prevent the defects from being seen by an examiner (the “go normal” phenomenon.) DNA testing will reveal this type of error. Some DNA tests currently on the market are not at all useful for Australian Shepherds, even though we may occasionally have dogs with those diseases. As mentioned earlier, marker tests can be breed-specific and will be useless for Aussies unless they were developed for the breed. At present, there are no such tests. Not every direct-gene test will be useful, either. Progressive Retinal Atrophy (PRA,) a gradually blinding eye disease, is very rare in our breed. There are multiple DNA tests for the disease because there are multiple genes that can cause it. The only one of these tests that should be used for Aussies is the one for Progressive Rod Cone Degeneration (PRCD). The Australian Shepherd Health & Genetics Institute has developed a recommended testing protocol which can guide you in determining which tests you might need to have done. Breeders should follow the above screening protocol on all their breeding dogs and, where applicable, screen litters and provide the new owners with a copy of the results. Puppy buyers should be encouraged go get testing done as per the above on all dogs whose status is not already established. When outside stud dogs are used, preference should be given to those that have been screened with DNA tests. Once you have results and know your dog’s status, what then? 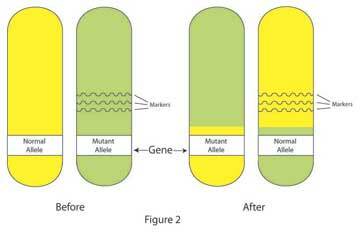 Does the presence of a mutant allele mean that dog needs to be withheld from breeding? Not necessarily. With a DNA test, you know the genotype of your dog. The point is not to produce puppies that will be ill or have defects. If you never breed a carrier to another dog that has the mutation, you will never produce a puppy at risk for the disease. Even a dog with two copies of a mutation might be bred in certain circumstances. There is no reason to cease breeding a dog that is “mutant/mutant” for MDR1, for example. Just make its status clear to people who have potential mates and give preference to “normal/normal” mates. Over time, this will lower the frequency of the mutation in the breed. Dogs with a double dose of genes that cause painful, crippling or lethal health problems should be removed from the breeding population unless the disease gene is so frequent that doing so will severely reduce the population of breeding dogs. So far as we know this is not the case with any disease in Aussies. Carriers, however, no longer need to be taken out of your breeding program because you will be able to verify that anything they are mated to is a non-carrier. This brave new world of DNA testing may seem hyper-technical and intimidating, but if you know what tests are available for your Australian Shepherds and how best to use them you can easily adjust to these changing times.